This tutorial is also available in Polish. The Framsticks Tutorial provides a step-by-step introduction to Framsticks. It covers basic issues related to program interface, simulation, genetics, and evolution. The tutorial also refers to a few more advanced functions, including writing user procedures, neuron types, etc. This tutorial can be used during Framsticks classes, and for self-education as well. It requires the Framsticks GUI (available to download from the Framsticks web site) installed on an MS Windows operating system (use wine on Linux and macOS). If you are a teacher, take some time to go through all steps and do the exercises. We recommend to quickly read through the Framsticks Manual first. You may want to skip some parts of the tutorial during the class, depending on your discipline. For example, you may focus either on simulation, genetics, evolution, interactions, or script programming. Computer science, robotics, biology, cognitive science or philosophy require emphasis on different sections. It is a good idea to first estimate the time needed for students to perform the tasks. You might also enumerate the goals that students should be able to learn (or be able to test) after they have completed this tutorial. You may ask students to prepare written report (or oral presentation) based on selected exercises. If you are a student or want to go through this tutorial to learn Framsticks, we recommend that you first browse the Framsticks Manual. Then start with the tutorial. It is a good idea to ask somebody else (a friend) to independently do these exercises as well, and later discuss them together and exchange ideas. If some parts are too difficult, you may skip them, and later go through the tutorial again. Refer to the Manual if you miss some information. Every year, the authors and longtime users of this software run classes, courses and workshops based on this tutorial. Depending on the level of detail covered and how far we advance, these courses last from 2×1.5h to 8×1.5h. Short 1×1.5h presentations and very detailed, advanced 10×1.5h courses are also possible. If you live near Poznan, Poland, you may be interested in the meetings and presentations in the Artificial Life Lab. The full documentation is available on the official web site (which is the best place to get information) and is summarized in the Framsticks Manual. This tutorial is not a substitute for the documentation. Goal: see a few Framsticks creatures, their behavior, physical properties, interactions, etc. Setting: use the Framsticks GUI for Windows. Set the Simulator Parameters/Experiment/Populations/Creatures/Death to "off", enable OpenGL (if available). This presentation can also be performed using the "Framsticks Theater" and the "presentation" show. Experiment/Populations/Creatures/Death – should be off. Otherwise creatures could die unexpectedly. Genotype is the description (building plan) of a creature. Can be saved in a file. 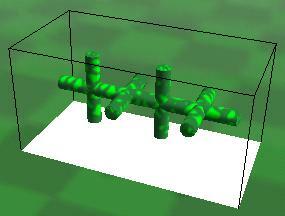 Mechanical simulation: can be MechaStick or ODE (rigid bodies). See the World/Simulation engine setting. Try both engines, use the manipulator to play with creature bodies and note differences. Enter a few more X's and move the cursor along the genotype. The structure view will highlight the corresponding body element. Click on the sticks to have the corresponding genotype part underlined. 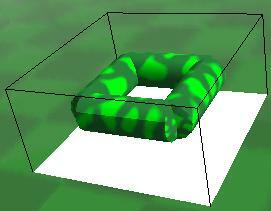 More shape modifiers: Q C L – insert into the genotype and guess how they work. See f1 encoding for explanation. Note the general rule: lowercase/uppercase letters have the opposite meaning. Note that red background means that the genotype is invalid – like "X[", and pink background means a genotype error which can be corrected automatically – like "X()". Some genotypes are valid in syntax, but problems arise during building creatures. Try for example the "X[|][|]" genotype, which has two identical muscles in the same place in body. As this is invalid, an additional entry will appear ("Build problems encountered!") in the small arrow menu in both panels displaying body and brain. Click it to see the list of build problems. Exercise 2: Can you write another genotype resulting in the same shape? Exercise 3: Build an interesting shape using this genetic language. Only tree-like structures: closed loops not possible (although you can build an open-loop square easily - try to do it, and then simulate it using MechaStick and ODE simuators, jiggle it with the manipulator hand and spot the difference). See interactive demonstrations of basic sensor and effector neurons. You can have a look at the f1 encoding reference. Experiment/Populations/Creatures: Neural net simulation is "Immediate"
Experiment/Populations/Creatures: Performance calculation is "Immediate"
Build a creature from this genotype (Simulate → Creatures) and start the simulation (Simulation → Run). The creature appears in the world and on the populations list. Select the creature by clicking on the populations list. This will associate the Body&Brain window with the living creature (and not with the genotype) and zoom the camera on it. Double-click on the neuron #1 in the Body&Brain window (on the neural net diagram). The tiny window inside the diagram is a probe. It can be used to display and change the signal. Drag the thick black handle up and down. You can see the immediate muscle response – the creature moves. Try to find the best signal pattern to make the creature go forward. Add the velocity indicator to the populations list: right click on the populations list → "Show columns" → "Velocity". Now you can read the current velocity while controling the creature. Click the red hold label to release the neuron output. We will use the "Sin" neuron (sinus generator) to obtain the muscle control pattern. [Sin,f0:0.1] is the sinus generator with the default output frequency of 0.1. 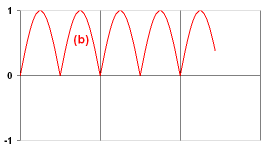 This frequency is also influenced by inputs. -2:-0.5 means "connect to the second previous neuron, weight -0.5"
[*] is a neuron which produces a constant value of one (1). Build the creature and select it on the list. The creature moves! This time the probe will show the signal for the sinus input and the muscle input. Add the first probe to the neuron in front of the muscle. Click and hold the left mouse button on the "1x" label and drag to the right. This will increase the time range of the displayed signal, making it more readable. Add the second probe to the neuron in front of the Sin generator. Move the handle up and down slowly. This way you can control the frequency of the generator, because the Sin generator changes its frequency according to the input signal. Observe the first probe. Exercise 1: Set Experiment/Populations/Creatures: Performance sampling period = 1000. Revive the creature. Find the optimal pattern (resulting in the highest velocity). You can change both the generator frequency and the constant value (the second input for the neuron in front of the muscle). Add another probe to the other muscle. Try to make the creature turn left or right by changing the signal. The new [S] receptors, placed on two sides of the creature, will provide different signal values when the food is close to either side of the creature. Can you use this information to set up the proper weights in the controlling (middle on the picture) neuron? Try to adjust weights so that the creature does not turn over when it turns! Exercise 3: Our previous creature was not particularly stable when it was turning. Add two smell sensors to the Back Crawler from walking.gen to create a perfect food finder! Exercise 4: Take the Right Angler from walking.gen and see how its speed depends on the frequency of the sinus generator. Then, using the "Energy" sensory neuron, make this creature move fast when it has a lot of energy, and slow down gradually until it dies. Subsequently implement the opposite behavior. The creatures we built in previous exercises can already sense the environment in one simple way: looking for energy sources. Now it's time for a more dynamic interaction: use specialized neurons to send and receive signals between creatures. Disable energy calculation or death, set Experiment/Populations/Creatures: Neural net simulation to "Immediate". Build the following creature (name it Sender): X[Sin][Light,-1:1] and examine its behavior. As the name suggests, Light is the light-emitting effector. 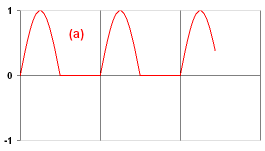 Connecting it to a sine generator creates a periodically flashing device (for positive values of sinus). Note the grid of squares appearing while the light is on – that's the way Framsticks visualizes signal strength. Try controlling the Light effector using a neural probe. Add several Receiver creatures and examine their reaction to light signals. Place several Feedback creatures and one Sender, forming a line. Each Feedback reacts to incoming light by enabling its own light emitter, but only above the certain activation threshold (depending on the input weight of the * neuron). The whole chain of creatures acts like a light conductor, passing the signal between creatures. Note: You may need to carefully adjust the distance between Feedback creatures – bring them closer if there is no reaction, increase distance if their mutual influence is too big. Make the light signal propagate more slowly. How could this be achieved? Can you make a cockroach (a creature that avoids light and looks for food when it's dark)? Imagine evolution of fireflies. Our goal would be to get creatures that synchronize their flashing despite random starting conditions. How would you define the fitness function? How a creature would be evaluated? Read the light.neuro and seelight.neuro files – they implement simple communication neurons we used in this section. Adding more communication channels is as easy as copying these files. See also the Scripting section below. See the Boids show (Framsticks Theater) or Boids expdef (Framsticks GUI) for more sophisticated inter-creature communication involving scripting. A concise description of communication features is also available in the Framsticks chapter of the book Artificial Life Models in Software. In the previous exercises, we tried to make fast moving creatures by hand. Let's see if the evolutionary algorithm in Framsticks can be used for this purpose. Genetics/f1/Neuron net: Add/remove neuron and Add/remove neural connection set to 0, all other: 1. Learn how to save and load files. Using menu:File, save genotypes (for example under the name my_genotypes.gen), parameters (for example under the name my_params.sim) and experiment state (for example under the name initial_state.expt). Close Framsticks. Find the three files you saved on your disk and view their contents using any text editor or file viewer. Open Framsticks, and then load the experiment state file – either using menu:File→Load, or using drag-and-drop (you have to drop the experiment state file onto the title bar of the program). Open a chart. Go to Interface options → simulator charts, select property "Genotypes: Fitness: Average Fitness", click Apply, click Add chart. Select property "Genotypes: Fitness: Maximal Fitness", click Apply, click Add chart. Close the window (press ESC), and show charts window by pressing [Shift-F6]. Think about the expected shape of these charts, explain why. Start the simulation. Watch the gene pool window. You can sort the "velocity" column to see if the evolution is making progress. Press [F9] to hide windows and make the evolution run faster ([Shift-F4] will show the window with genotypes). [F4] restores the default layout. There are many parameters influencing the algorithm. See the "parameters reference" in the Framsticks documentation. Have a look at the charts. Compare average and maximal fitness (speed). Were your expectations correct? After some time when you see no improvement, set "Delete genotypes" to "Only the worst". Watch the charts. What happened? After some time when you see no improvement, write down the best evolved speed value. Who is the winner? Is the evolved creature faster than your hand-tuned one? Identify what parts of the original genotype were changed by evolution, and what is the meaning of the changes. Let the evolution adjust stick length. Set "Genetics: f1: morphology: add/remove a modifier" to 1. Set "Excluded modifiers" to all except "L" and "l" (which are RrCcQqFfMmIiDdGgBbHhEeWwAaSs). Continue with the evolution and see if the morphology changes. You can switch "Delete genotypes" between "Only the worst" and "Randomly". After some time when you see no improvement, write down the best evolved speed value. Let the evolution add and remove neurons, receptors and muscles. Set all values in "Genetics: f1: neuron net" to 1. Continue with the evolution watching the charts. You can switch "Delete genotypes" between "Only the worst" and "Randomly". After some time when you see no improvement, compare the best evolved speed value with the two values you previously noted down. Try to guess what might be the results of evolution if you set the Experiment/Populations/Creatures: Neural net simulation: "Immediate". Then clear all gene pools and populations and test your hypothesis experimentally. Set all parameters appropriately, clear charts, run the evolution, and compare its outcome to previous results. Try to build as tall as possible, but stable, creature, using the 'f1' genetic encoding. Do not use neurons, just body. Save its genotype in a file, e.g. "my_tall.gen". Exit Framsticks and launch it again (to ensure all parameters have their default values). Experiment/Populations/Creatures: Neural net simulation: "Disabled"
Add a simple X genotype. Start the simulation. Watch the gene pool window. You can add the "Vertical position" column (right click on genotypes list) and sort it to see if the evolution is making progress. Press [F9] to hide windows and make the evolution run faster ([Shift-F4] will show the window with genotypes). [F4] restores the default layout. Who is the winner? Is the evolved creature better than the one you designed? Try to guess what might be the results of evolution if you set the Experiment/Populations/Creatures: Neural net simulation: "Immediate". Then clear all gene pools and populations and test your hypothesis experimentally. Set all parameters appropriately, run the evolution, and compare its outcome to previous results. Now you will have to evolve creatures that are both tall and simple. Look at the Experiment/Parameters/Fitness settings. You have to maximize "Vertical position" and minimize the number of "Body parts" at the same time. Suggest the fitness function. Think about the values of vertical position and body parts. Enter your weights for these criteria, press apply, and then check the Experiment/Gene pools/Genotypes/Fitness formula. What is the disadvantage of this way of computing fitness? What is "normalization"? Try to guess the meaning and purpose of Experiment/Parameters/Fitness/Criteria normalization. Perform the experiment with evolution. Is the result satisfactory? If you have problems with getting interesting results, identify the reasons and ways of overcoming this situation. Repeat the experiment again a few times or compare your result with your friends' results. Who has the best tall-and-simple creature? Consider both criteria and try to compare all best evolved creatures. Have a look at Fig. 1 on page 3 and notice how various genetic representations are translated, and where genetic operators are applied and where evolution takes place. Read the section on the 'f0' encoding from Genetics. Build the following shapes: square, cube, tetrahedron, a tent. First draw these shapes on a sheet of paper and specify the 3D coordinates. Then suggest some other simple, but interesting shape, and build it. 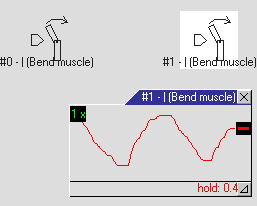 Build a simple neural network with three neurons connected in a line (Touch, N, Bending muscle). Change the placement (embodiment) of the Touch sensor in the body (assign it to different Parts). Check the 'f0' genotypes converted from their 'f1' analogues. Enter simple 'f1' genotypes (bodies and also bodies with brains), like the ones from section I.4, press "Apply" each time, and then inspect and understand the "Conversion: f0 genotype" field. For "relative" Joints (those using dx, dy, dz and rx, ry, rz), it may be helpful to see 3D orientations of Parts. Try theater -vaxes=1 -g X(X,X) and theater -vaxes=1 -g QQXXXX(X,X). Use theater -g - to enter multi-line 'f0' genotypes from the console or use the < redirection from a file. Repeat the experiments II.2 and II.3, this time using the 'f0' genetic encoding. To do it, empty the gene pool and populations, run the simulation and choose the simplest 'f0' genotype from the list of choices. First formulate your expectations as to the differences between 'f1' optimized creatures and 'f0' optimized creatures. Later verify if you were right. Restart Framsticks. Set Experiment/Experiment definition to "neuroanalysis". Press "Apply". Read the Description. Close the parameters window. Load "walking.gen". Open the parameters window and press "Initialize experiment". Close the parameters window and run the simulation. Close the world window to speed up simulation. Do not touch anything until the simulation is automatically stopped. Then inspect some genotypes and have a look at their "Description" field (in the "Notes" group). Discuss how the information computed by this experiment definition can be used and what is the meaning of these values. Restart Framsticks. Set Experiment/Experiment definition to "reproduction". Press "Apply". Read the Description carefully. Press "Initialize experiment". Close the window and run the simulation. Open the Messages window. Watch the simulation. Can you tell what is the maximal possible number of living creatures? Is it possible that all creatures die out? Is the evolutionary improvement taking place in such a setup or not? What to expect after a veeeery very very very long time of simulation (millions of years on super powerful computers)? What is the difference between this setup and the analogous EA experiment like those from section II? Restart Framsticks. Set Experiment/Experiment definition to "learn_food". Press "Apply". Read the Description carefully. Press "Initialize experiment". Close the window and run the simulation. Test the influence of the Experiment/Parameters/Share knowledge parameter on the system. See also Experiment/Parameters/Energy/Food placement parameter. Try to explain how the results were computed.
? 7 && 42 && "oh"
? (7  && "abc" || 0) ? "yup" : "meh"
Further FramScript information can be found here. Now have a look at this piece of code. Study every line to ensure you know how it works. If you discovered how the coordinates are computed based on the number of creature (varialble "i"), now ensure that the simulation is stopped, copy this piece of code, paste it into the console window, and execute it. See how the creatures are located: make the world window full screen and rotate the world. As you can see, this piece of code automates many operations. When writing scripts, always inspect the most recent messages in the "Messages" window. If you see any warnings or errors, "expand" them – usually you will see very useful information on where your scripts have some issues. Always ensure your scripts do not produce any warnings or errors! Have a look at the Experiment/Gene pools/Genotypes/Fitness formula. This formula is automatically updated each time you change weights for the optimization criteria. However, you can create the fitness formula according to your wishes using if (condition) action();, temporary variables, loops, etc. First you have to learn about the fields you can use in the fitness formula. In the Framsticks GUI, choose menu "Help" and "FramScript: reference". Check the "Fitness formula" context and the "this" class, its methods and fields. Then see the "Math" class in the global context. Now is the time for your experiments. Implement the following fitness functions, and for each function, explain its meaning and verify it practically. Take care of special situations (divisions by zero, square roots of negative values, etc.). Conditional fitness: if a creature has less than 5 Parts, then fitness is creature's height. Else fitness is creature's height diminished by 0.1*(number of Parts minus 5). 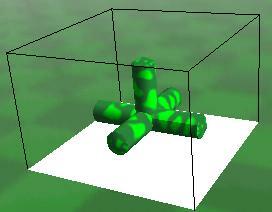 (advanced task) Fitness is the number of Joints divided by the volume (x*y*z) of the bounding box of the Model made from Geno. See more scripting resources including the full reference for contexts, classes and methods. If you are going to write larger pieces of code in FramScript, consider using Framclipse. Now have a look at the source of the noisy neuron (the noisy.neuro file). Can you explain how it works? (a brief description of this neuron is also available in the Framsticks chapter of the book Artificial Life Models in Software). Find out what genotype to use to test this neuron. Then verify if your explanation was correct. Discover what procedures ("methods") can be used in FramScript. In the Framsticks GUI, choose menu "Help" and "FramScript: reference". Take some time to browse various classes that come to your attention. Check out the "Math" class, its methods and fields. Copy or save the noisy.neuro under the different name (exa.neuro) but in the same directory. Edit this file and change the neuron name by modifying the appropriate line: "name:ExA" (neuron names must start with a capital letter). Long name should be "Exercise A". Now try to modify the function go() so that the output of the neuron is the sinus function. Save the file, restart Framsticks, see the Messages window for errors. If everything is fine, create a genotype to test your ExA neuron. If your neuron code was invalid, try to correct it or ask the tutor. Now there comes the real exercise (a). You have to design the neuron which outputs the signal as shown on the figure. Note that your ExA neuron should have one parameter (t) to set the period of this pattern (the number of simulation steps after which the pattern repeats). Instead of restarting Framsticks each time to load your new neuron code, try clicking the Simulation Parameters/User scripts/Reload neuron definitions. Set the parameters as described in section II.1 and try to evolve this moving creature that uses the neuron you just designed! As before, only allow for mutations of neural properties and connection weights – body should not change and no new neurons should be added. If you were successful, solve the next three tasks. For each of them, create a separate file (exb.neuro, exc.neuro, exd.neuro). 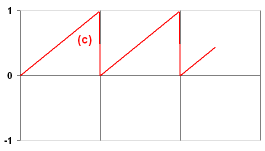 In Exercise (d), you need two parameters which specify the widths (in time steps) of the high and low output states. For some tasks, you may need to introduce the init() function to initialize some NeuroProperties. Ask the tutor if you cannot cope with some problem, or skip this problem if you cannot get help. There are five more challenges for you! 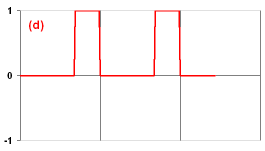 First, build a neuron which makes the input signal smooth by averaging the current input with the two previous inputs. Use weighted input sum, not individual inputs. Then build a neuron which outputs the maximum value of its inputs. Design the appropriate neural network to test it. Then build a neuron which multiplies the first input by the second one, and outputs the result. Then build a memory cell. The first input is the value to save. The second input is the control signal: if it is less than zero, then your neuron should memorize the first input value (and output it). If the control signal is zero or more, your neuron should output the memorized value regardless of the first input. Finally, build a neuron which outputs two values at the same time using channels. Your neuron should compute weighted input sum and output it as (always) positive value in the first channel, and (always) negative in the second. Later you can use the ChSel neurons to select a single channel from a multichannel output. Note that although we designed regular neurons here, the go() function can use information about the world and other creatures, so you can easily design your own sensors. Effectors and receptors can be developed as well. Now analyze carefully and ensure you understand "neuroclsreport.script", "foodcircle.script", "creaturescircle.script" and "gallery.script". In the Framsticks GUI, find the Simulation Parameters/User scripts. You can run the scripts to see how they work. Remember the sample in section IV.2? It can be saved in a *.script file and executed with just one click. jiggle creatues! for all creature groups, for each living creature, for all its MechPart's, add a small random number to its velocity. It is a good idea to put the jiggling function in the experiment definition, and run it e.g. every 200 simulation steps. To achieve this, add a proper condition (call your script when the simulation stepNumber modulo 200 equals 0) at the end of the onStep() function in the standard.expdef file. If, for some reason, you would like to save some data in a regular file during simulation, you can use the File object. See the scripts\neurof0html.script, no need to understand in detail how it works, but it illustrates how the File object can be used. You can run this script and see the file created in the scripts_output subdirectory. Download the CLI and prepare it for use. Run "frams". Enter "lm". Inspect the "frams.ini" file, pay attention to the init() function and learn how macros are associated with implementing functions. Experiment with the following macros: im, sa, st, lg, lc, qu. The go macro starts the simulation, Control-C stops it. See that you can enter commands as in IV.1. Import "walking.gen", set the gene pool capacity to 20 (using FramScript: ExpProperties.capacity=20;), set the number of simultaneously simulated creatures to 2 (ExpProperties.MaxCreated=2;), run the simulation until 1000 creatures are evaluated (using FramScript while loop, for inspiration see how the go macro is defined), while the evaluation takes place watch simulation speed (this is displayed in the window title), then export genotypes to "walk2.gen" (read the documentation for Simulator.export), and save simulator state to "walk2.expt" using the sa macro. Have a quick look at the contents of the "walk2.expt" file using any text editor. Load "walk2.expt" in GUI (you can drag a file and drop it onto the title bar of the application), start the simulation, press F9 and compare simulation speed (displayed in the right top corner) with the speed you experienced in CLI. frams "? 2+3" "lo walking.gen" "lg" "qu"
Make neuroanalysis.expdef evaluate all genotypes from walking.gen, and then save the resulting gene pool ("sa walk-analyzed.gen"). If you use an experiment definition other than standard.expdef, you have to set it as an argument in command-line like this: frams "ex neuroanalysis". Don't forget about initializing the experiment. Create a "cmds-neu.txt" file with the commands you issued in the recent exercise, quit frams, and use it in batch mode. For a mature working and useful example of a shell script (*.cmd) and a macro (*.script) that run a complete parametrized experiment, see evolve-speed-vs-gravity. You can modify this example to suit your needs. If you want to evaluate some kind of a complex lifetime behavior that cannot be expressed as an aggregation of pre-computed performance indicators (like velocity, life span, or vertical position), you can use Creature's data dictionary to store any information you need. This field is versatile and can store any object, including Vectors and Dictionaries. You can modify values in the data dictionary in each simulation step depending on where the creature is, what it does and how it behaves. If you want such evaluation to be used as fitness, you have to propagate it from Creature to Genotype. Find the following line in standard.expdef: "Want to copy customized values from Creature data fields to Genotype data fields?" and assign the fitness component (that you computed and stored in Creature's data dictionary) to some key in the data dictionary of the Genotype (g). Then, in the fitness formula (which is defined for genotypes), you can use this.data->myfield any way you need. The "Custom fields dictionary" of a Genotype and a Creature can be displayed in Framsticks GUI, which is helpful for debugging. Save the file. Run Framsticks GUI and activate the "standard-MY" experiment definition. Add one "X" genotype. Simulate it. Double click the living creature in the Populations list and see "Custom fields dictionary" in the "Current performance" category. Save the file. In GUI, go to Parameters, click "Reload experiment definition" button and close the window. Add one "X" genotype. Simulate it a few hundred steps until its Energy starts to decrease. Double click the living creature in the Populations list and see "Custom fields dictionary" in the "Current performance" category. Save the file. In GUI, go to Parameters, click "Reload experiment definition" button and close the window. Add one "X" genotype. Open the "Messages" window. Run the simulation until the creature dies. Double click any genotype in the Gene pools list and see "Custom fields dictionary" in the "Performance" category. See also the contents of the data/messages.out file. This is the same as the "Messages" window! In simulation parameters→World, set "Type" to "Height field" and "Map" to a 4x4 height matrix: "M 4 4 1.0 1.2 1.4 1.6 0.5 0.7 0.9 1.1 0.0 0.3 0.5 0.7 -0.4 -0.2 0.2 0.4". Now you can perform evolutionary optimization according to fitness which is... what you defined above! Compute Genotype's distance as a difference between the place of birth and the place of death. Compute fitness as the height of the topmost Part, averaged during the life span (measured in onUpdate events). Cleaning: when two creatures collide outside of the world center, move the bigger one to the world center. If this place is already occupied (collision with another object, use LiveLibrary.creatBBCollisions), the creature is moved higher. Fight for resources (arena): creatures are born on two sides of a spot and the one which is able to cover most of the spot gets higher fitness. Pursuit and evasion: two gene pools, two contradictory fitness functions, one group of creatures is evolved to escape, the other one – to follow them. See the scripts/*.show files, choose some simple show, discover what "onSomething" events are implemented, save the show with a different file name, modify it, restart the theater application, and test your modifications. You have to use a registered version of the theater to test your new shows. Have a look at the 3dobj/*.style files. Proceed similarly as described above. Read the tutorial on scripting, it includes a related example. You need a registered Framsticks GUI to test your new OpenGL styles. See also the Spooksticks story.